It’s October! October is near and dear to my heart, because as a breast oncologist, it is Breast Cancer Awareness Month! 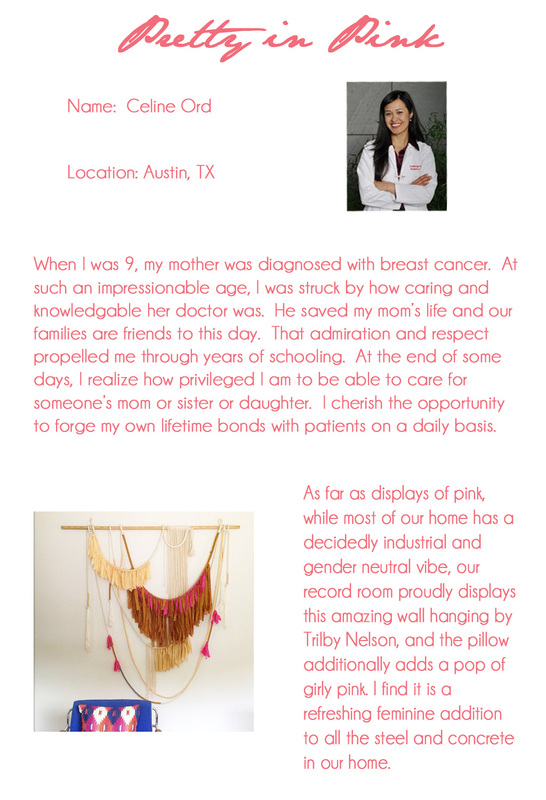 As much as I love design and DIY, treating breast cancer is my other passion. Breast cancer is the most common cancer in women (aside from skin cancers), and 1 in 8 women will develop it during their lifetime. Fortunately, as detection and treatment are getting better, death rates are declining. An important part of this is AWARENESS. In an effort to combine these two passions of mine, the rest of this month, aquahaus will feature different bloggers in a limited series- Pretty in Pink. In this series, each of these amazing and talented women will share their experiences with breast cancer and then showcase a space in their home or a project, which includes some pink! Each of these women is incredibly inspiring, kind, and generous. I’m so excited that they have graciously afforded some of their time for this series. Ultimately, I hope that this will serve as a platform to continue to increase breast cancer awareness. I’m going to kick things off today with my own experiences. Breast Cancer Detection: Women starting at age 40 should undergo a yearly mammogram. There are additionally different risk assessment models, but those with a significant family history of breast cancer (first or second degree relative), a known genetic mutation in the family, a personal history of chest radiation from ages 10-30, should get both yearly mammogram and MRI. Please come back tomorrow to check out our first Pretty in Pink guest! ← One Room Challenge: Week 1- aquahaus gets a Rooftop Lounge!